Here's solution of how to free download 2019 NBA playoffs video like the finals, highlights and top moments in 720p, 1080p HD MP4 online. Unarguably, the most excited season of National Basketball Association (NBA) is NBA playoffs including the finals to device championship through best of seven knock-out tournaments among 16 teams of Eastern Conference and Western Conference. 2019 NBA Playoffs kicked off on April 13, 2019 and will end with the NBA Finals. For most basketball addict, it is very regret to miss this tournament live. Instead, some fans may choose to free download NBA playoffs video to enjoy the new season fixtures or best matches, memorable highlights in precious seasons. 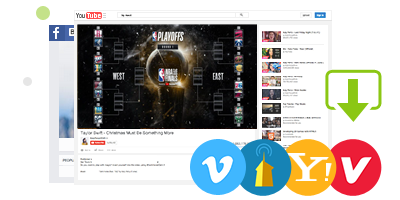 This article will guide you to free download 2019 NBA playoffs video using an user-friendly sports video downloader for watching NBA playoffs on PC/Mac or portable devices avoiding ads, long-time loading and interruption resulted from poor network. As you want, you can review best NBA Playoff moments throughout NBA history. Want to Watch 2019 NBA Playoffs Offline? In fact, NBA playoffs videos collected in YouTube and alike sites only allow viewers to watch online but no download. Therefore, a tool for video download is in need, for example, WinX YouTube Downloader, which is capable of free downloading sports videos (including NBA Playoffs/Finals, UEFA Champions League, Syracuse basketball, MLB etc. ), music videos, movies, news and more in diverse qualities (360p SD, 720p/1080p HD, even 4K/8K UHD) and formats (MP4, FLV, 3GP, WebM) at a very high speed. Compared with some other downloader in the market, it is perfectly clean without adware, spyware or virus and no harm to your computer at all. 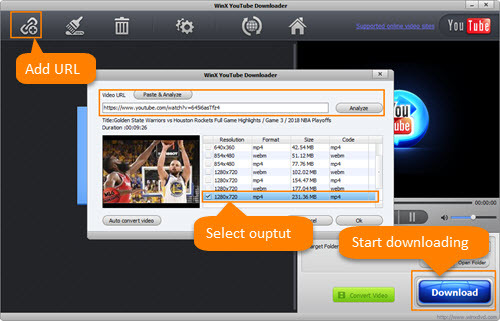 Download and install WinX YouTube Downloader on your PC and then follow the steps to free download 2019 NBA playoffs video in HD. Step 1. Open WinX YouTube Downloader and hit +URL button on navigation bar. Step 2. Search 2019 NBA playoffs video on YouTube or any other supported sites and select one video you would like to download. And then, copy and paste its URL to address bar. Step 3. Hit Analyze button to access video information, containing video title, duration and video version in various resolutions, sizes, formats and codec. Check HD (1280x720) MP4 version and click OK. Step 4. Save video to target folder by clicking Browse and hit Download button to start HD NBA playoffs video free download process. The downloaded video cannot be played on your mobiles? Don't worry! Click Convert Video button next to Download to access to the solution which can help you get a video fully accepted by iPhone, iPad, Android/Windows devices. Following regular season, NBA playoffs usually kicked off in March or April. Through several times changes of rules, the current revised playoff seeding system was officially announced on August 3, 2006. The champions of three divisions in Eastern or Western conferences and another team with second-best record from the best record division in conference are picked as 1 to 4 of each conference and another four teams with best records of remaining teams in each conference are seeded 5 to 8. At first, 8 teams in each conference played 3 rounds (conference quarterfinals, semifinals and finals) of best-of-7 series to device conference champions who will be invited to NBA finals to win NBA title of this year. * Free Download SD/HD/4K/8K NBA Playoffs and other sports/movies/music/game guide videos from YouTube, ESPN, Dailymotion, Vimeo, Metacafe and more. * Convert any online videos and 4K/HD videos (MKV, MTS, MOD etc.) to MP4, H.264, HEVC, AVI, WMV, MOV, iPhone, iPad, Android, Windows Mobile, Xbox, Sony PlayStation etc. * Integrate with Hardware Acceleration tech (Intel QSV, NVIDIA NVENC) to accelerate video encoding, decoding and processing helping deliver the fastest conversion speed while maintaining perfect quality.